Washington, D.C. – As the leaves begin to fall and the temperature begins to drop, CityCenterDC has unveiled a never-before-seen installation, Autumn Forest, over Palmer Alley. Now through the end of October, visitors will enjoy thousands of autumn leaves suspended above the main retail transverse of the neighborhood, creating a warm harvest sky. Unlike the previous Palmer Alley installations (City in Bloom, Dream Closet and Summer Beach Ball) the Autumn Forest has been designed as a horizontal canopy. As one of the most photographed destinations in Downtown DC, CityCenterDC is always striving to bring creativity, color and joy to Palmer Alley. To celebrate the new season, CityCenterDC contracted with Silver Lining Design Group, a local design firm, to create the fall-inspired art component. “We are excited to work with CityCenterDC on another vibrant and inspiring addition to Palmer Alley,” said Marielle Shortell, owner of Silver Lining Design Group. After a full week of installation, 5,975 branches and approximately 269,000 festive fall leaves are now seen casted over the corridor. “We love to see visitors interacting with this public space and photographing the installations, which create an experience like no other in Washington, D.C.,” says Timothy Lowery, general manager of CityCenterDC. 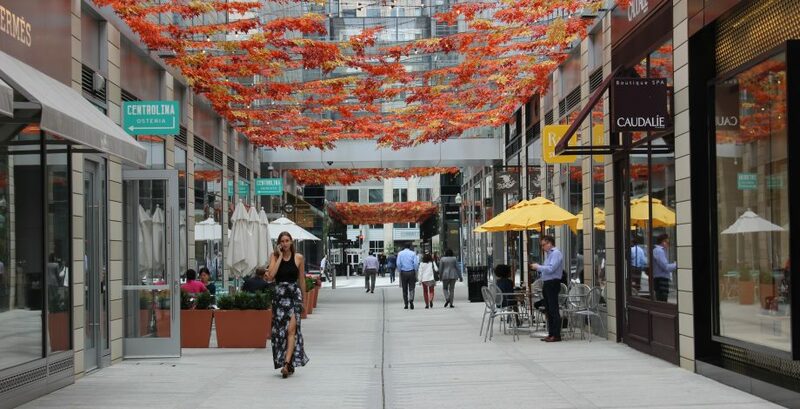 As the fourth large-scale overhead décor installation in Palmer Alley, the Autumn Forest is continuing CityCenterDC’s efforts to create a truly unique and dynamic destination for residents and visitors to enjoy. Following the Autumn Forest installation will be the second annual installment of the Dream Closet in late November. CityCenterDC invites you to share your photos of the installation on social media. Use hashtag #CCDCFall on Instagram for the chance to win a $350 CityCenterDC gift card. Official rules can be viewed at CityCenterDC.com/events. CITYCENTERDC (www.citycenterdc.com) is a unique, pedestrian-friendly, 10-acre mixed-use development, located in the heart of downtown Washington, D.C. Developed by Hines and Qatari Diar, the project is home to more than 191,000 square feet of retail space, 520,000 square feet of prime office space, 458 rental apartment units and 216 condominium units, a 1,550 space parking garage, a public park, a central plaza and pedestrian-oriented streets and alleyways. Construction of the Conrad Washington, DC, a 370-room luxury hotel with 30,000 square feet of additional retail space, commenced in 2016 and is expected to open in 2019. The Autumn Forest installation is part of the 2017 Public Space Programming calendar that was created by the CityCenterDC Common Area Association. CityCenterDC’s ownership created the Common Area Association to provide for the maintenance, operation, and programming of the Common Areas which strive to foster a unique, truly-exceptional, pedestrian-friendly mixed-use urban environment. Silver Lining Design Group is an award-winning event production company crafting beautiful environments and experiences to elevate your brand or interior. With a reputation for excellence and a passion for detail Marielle Shortell, founder of Silver Lining Design Group, embodies innovative style. With over a decade in the event design industry her extensive skill set has attracted clients from Los Angeles to Miami. Creating award-winning events in major cities across the world, Marielle has built an impressive client list that includes BET, National Geographic, Virgin Atlantic, People Magazine, Essence and many more. With regular TV appearances, Marielle has also established herself as an authority on lifestyle, decorating and entertaining.